Ageless, Faceless, Gender-Neutral, Terran Adventure Person's Journal #2: Well, I've explored the entirety of town, now. After having been shot at by Glockmups and Stickrobs (and damn, do those Stickrobs hurt when they fire away!) I managed to find my way to both the Artificial Park – which simply has to be a dead end, given I can barely even find anyone who'll talk to me there – and the Hot Quarter. After finding a lovely lady (and having her promise that I'll spend the night with her), I continued through to find the Xifo Club and its corresponding business building, both owned by the influential Crisa Kortakis – which I'm fairly sure I can finagle an interview with if I can just find my way into the club. It's going to be expensive, given I can't even find a bouncer to bribe.. boy, I hope B.A.T. take all of my receipts on tax! This is what I found at the adult theatre in the Hot Quarter's 'films' department for 5 Krells. I'd first like to apologise for not being able to get a post up earlier. Conjunctivitis is not at all fun – I've essentially been without my right eye for the past week. It turned this completely menacing shade of red and everything. Unfortunately? It was far, far more interesting than this game is turning out to be. I was promised (by Trickster, no less!) 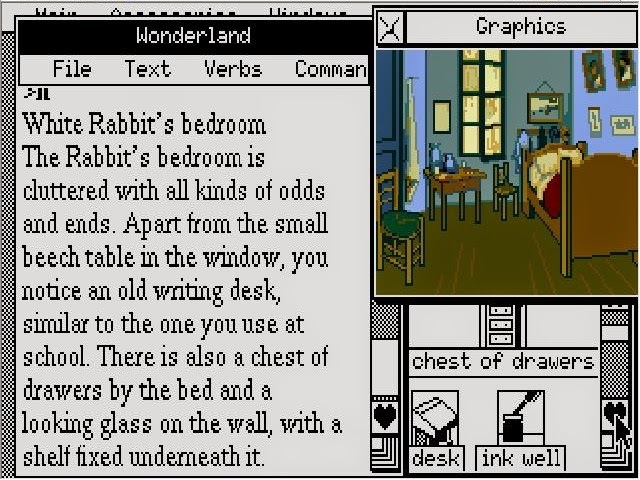 that the game had an engrossing atmosphere that would be sure to draw me in. It.. just doesn't. 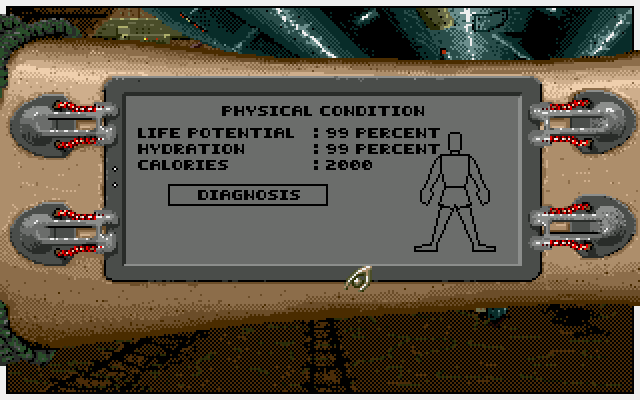 After taking some advice from Jan Larres which came straight from the manual after the last post, I can say that I no longer have to go through and use the 'translate' function every time, while I left all of the 'personal health' meters alone as B.O.B. only allows about ten lines of code in a program at once.. but even that took inordinately long. 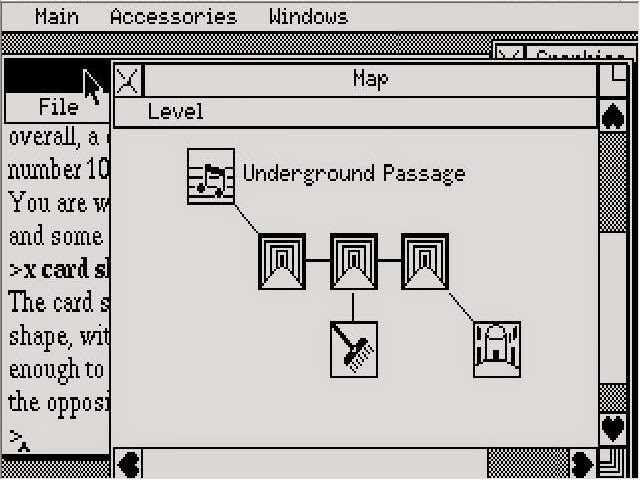 It's a screen with an up and down arrow along with around about two dozen options – none of them conveniently located next to each other, forcing up and down arrow usage to be clicked repeatedly. Slowly. 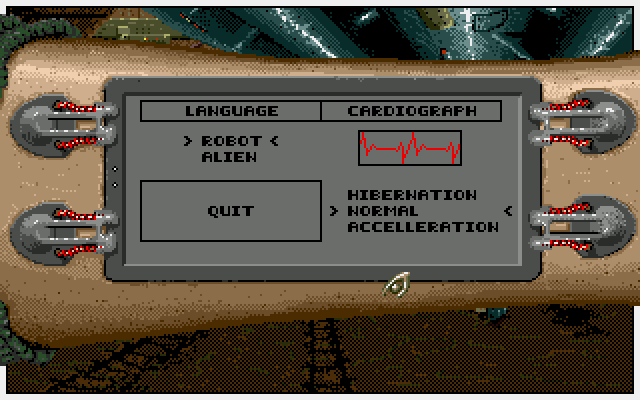 A scroll bar, even, or just smaller font, would have done the cyborg-masters at B.A.T. far better justice. Random combats pop up out of nowhere and simply aren't fun – they're clickfests and seem to require you to select your weapon each and every time, and only seem to pad out the game – I haven't received any of the native currency for the effort of self-induced RSI that the game seems to want to inflict upon me for doing so. In fact, I haven't yet found anything that will provide Krells apart from the 'Bizzy Game', a version of Simon Says which gives them away at 5 a pop – in contrast, a Nitrokola, the cheapest drink I've found, has a real value of 6 – 12 minimum after my barter skill. It flashes three symbols and you then have to click them in the order they popped up. Oh, also? If you leave your credit chit in there after leaving the machine, it's lost forever. Vive le France! The only thing with a face here. If you hold the mouse in the wrong spot you can't even talk to (it). Conversation with two people at once! Well, two on the screen. Still, aside from the 'krotospaiis skeleton' from the desert (totally not a dinosaur, just ask the writers of the game), there's really nothing much I can find to interact with. This place is definitely on my 'something's up here' meter, though, and will doubtless be revisited before too long. However, far more clues have led to the Hot Quarter – or as I like to think of it, the carnival quarter. Why the carnival quarter? Everyone you speak to asks for money, and the majority of them that take it respond with the default 'Would you mind not wasting my time !!'. After giving them money. Harumph! 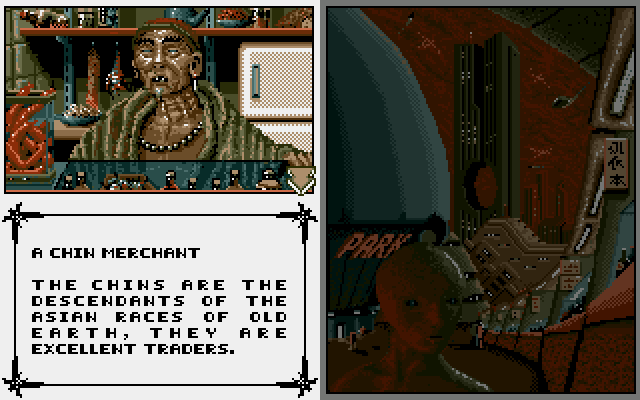 The opening screen to the quarter is just an old man standing around to take money just to say 'oh, the hot quarter is over there!' 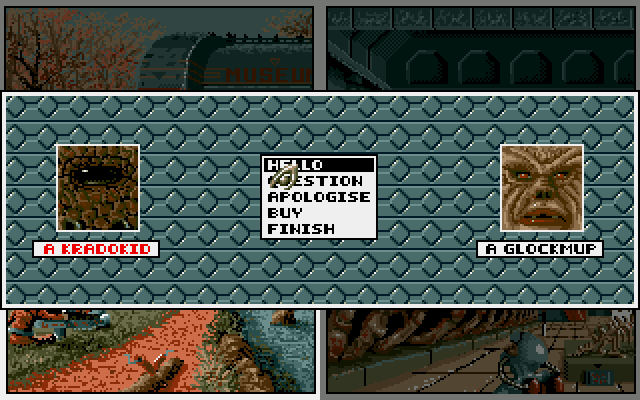 The next screen has the aforementioned gambling house and what I can only think is the 'Terran only nightclub', where the game's inbuilt 'romance' system comes into play. It's essentially more RSI-inducing frantic clicking to no real notable avail, so I'll leave a video link to give an indication of the HOT ACTION that comes through from it.. (Unfortunately, I can't work out what to do with it. 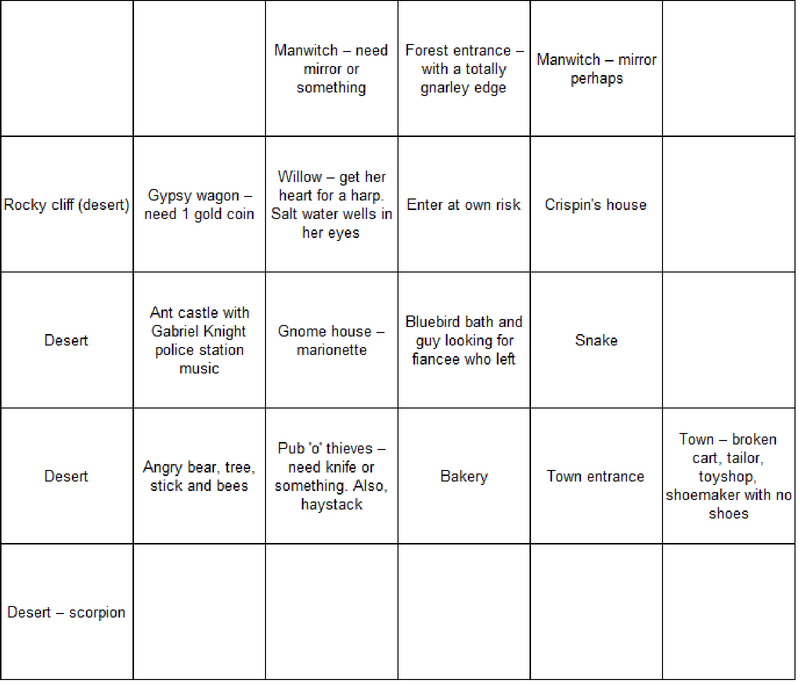 The game states that the person you 'seduce' will 'follow you around town', but I can't find anywhere to take her. 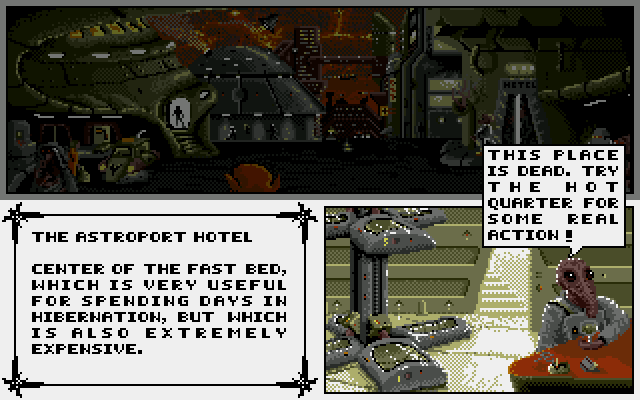 The 'hotel' is just a cryogenic bed that costs ludicrous amounts of credits and seems just to be there for healing purposes. The restaurants are all automated.. I'll admit that I've just realised that I could have taken her to the park – but what would we do, have relations in the not-dinosaur skeleton? On second thought, it looks a little more like a Sandworm from Dune.. I do hope that there's nothing more to the red light quarter than I've already found. There's lots of 'heart' symbols in there, but that just leads to more atrocious dancing, and my fingers are already feeling sore just thinking of having to 'show my smooth moves on the dance floor' again. At least you can frantically click the 'escape' button if you end up in a fight. Or perhaps the game is just telling me that I need to sit through and not click the mouse once! (I doubt this.) There don't seem to be any other interactible either people who stay on the screen or other places to visit in this section of the Hot Quarter, with just one more screen seeming to exist in this area of Terrapolis being the business HQ of Crisa Kortakis. Unfortunately, she isn't a particularly sociable person, with a huge bodyguard that you can't even try to blast away if you want to sitting in the front of the area, and her 'owned nightclub' not being accessible without an object, I presume a pass or something along those lines. I know this due to the manual and the manual alone – one of the ten context-sensitive icons is a 'question mark', which says you're missing something (or someone) to access or use with the thing you're hovering over. I thought that it was perhaps our lovely dancing maniac that it wanted me to take with us to the Xifo night club? It wasn't. French RSI-bait 1, Aperama 0. Even with my 'darling' Lydia on my arm, I don't get in? Damn it.. 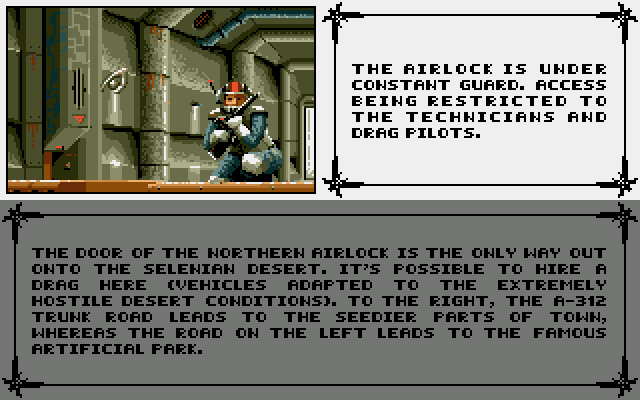 So, uh, I've read the manual, and it tells me Vrangor is out in the desert..
Can we just shoot him, Mr. Guard? I'm not quite at a dead end – I've still got plenty of people to both bribe and try to attack, but there's no real clear objective from here. I still don't know if the woman from the nightclub is actually still accompanying me around, as there's no way of telling it one way or the other (I've tried going through all of the BOB menus and the regular-game menus to see if I do) and I don't know if there are any practical benefits to the in-game timing system (e.g. will different people be around at 10 AM instead of 2 AM?) There's at least the modicum of hope that there's something waiting further on from here.. but really, the game has given me two pseudo-puzzles and an interface so awkward I've been back to re-check on things three times while writing this just to try and see if a second scan-through with the mouse will give a different object to interact with. Hopefully, a second run around of the park will yield results..
Game 52: King's Quest V - Stuck in Burkittsville Woods - Request for assistance! King Graham of Daventry Journal Entry #3: "I'm out of ideas. I defeated the witch in the forest and ransacked her home, but now I seem to be lost in the forest, unable to find an exit. I also helped a rat but suspect I should have done something to help the bird I saw running through the desert earlier. Am I doomed to stay here forever? I MUST find a way out – I CAN'T let Mordack keep my family prisoner while he tortures my son. There are some creatures here, but I don't know how to contact them." I was right about the amulet working against the manwitch, but after meeting her in front of her house realised it's definitely a womanwitch. The beard I thought I saw was just a long witchy face. This time the witch didn't bother casting a spell at me, but she stood guard in front of her house. I offered her the bottle, which I knew to contain an evil genie. That worked well. The witch is now imprisoned for 500 years in the bottle and I had free access to her house. Do witches sleep? I don't see a bed. In it I found two items – a small key and a spinning wheel. I couldn't use the spinning wheel myself because I apparently lack the skills. I thought that giving the wheel to the tailor might help me. The key opened a small door in a tree in the forest which contained a heart – clearly the willow tree's heart. So I now had two more ideas – give the heart to the willow tree and offer the wheel to the tailor, or perhaps the gnome if the tailor wasn't interested. Problem – I couldn't leave the forest – the screen from which I entered was no longer available. So, I'm in a forest that is rumoured to contain a witch, I seem to be travelling in circles and am unable to leave and I'm sure there are eyes watching me from the darkness. I think I've seen this movie. There is one screen that I seem to be able to do something with – a rock creature is there and blocks the way west, but I don't seem to be able to interact with it other than to look at it – there's also some eyes in the distance. When I tried using one of my items on the eyes, it said “The small creatures, whoever they are, don't seem to show any interest in it.” I tried every item I had (a boot, custard pie, small key, magic wand, amulet) but they didn't want anything I had. Convinced I had missed something, I reloaded and went back to some other areas to see if there was something new there. I tried the haystack again - nothing, checked out all the shops, offered everything new I'd picked up to the snake, tried everything but going back into the desert. I was pretty sure I could give the boot to the shoemaker so he could either swap it for something or offer to fix it for me. On the way from the baker back to the town with my boot, something new happened – I saw a rat running from a cat. I didn't have time to try anything before the cat caught the rat. I tried to talk to them as they left, but no luck. Oh well. I continued to the town. After unsuccessfully offering the boot to the shoemaker his wife and his dog, I decided to try going back into the bakery and leaving again to find another cat-rat scene, but it looked like that cat-rat scene was a one-off. I was pretty sure it was important so I reloaded my game from yesterday and tried going to and from the bakery again. I again saw the cat-rat scene, but immediately saved so I could try a few things. This time I tried talking to them both or picking them up – no luck. I tried my inventory items on them – first the boot – success! I threw the boot at the cat and the rat thanked me and offered my help. 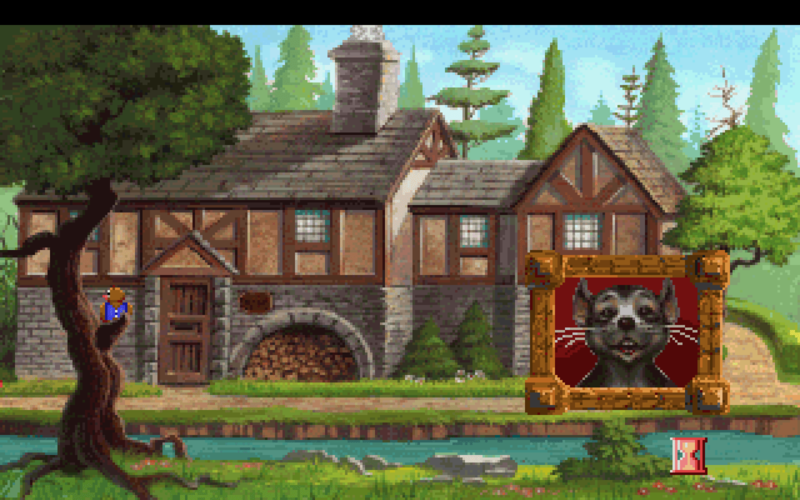 I assume the rat is king/queen of his tribe, as every other animal I've saved has been royalty. I'm a king myself and clearly won't lower myself to save a peasant - they can look after themselves – they're all dirty and they smell too much for my high-born nose anyway. This is the first creature I've saved that wasn't wearing a crown. So, another new idea - rats can eat through ropes. I got myself captured by the inn thugs again, and this time, as I'd hoped, King Rat came through the rat-hole and ate through my rope. I picked up the rope, which somehow looked like a full coil of rope despite having to have been eaten to threads by the rat (magic rope?) 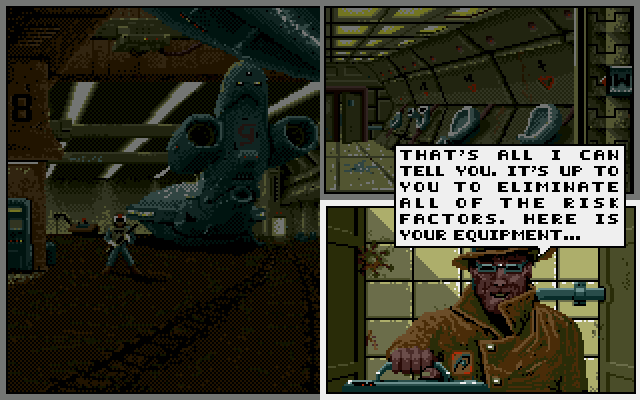 There didn't seem to be anything else I could do in the cellar though, and after a time I still got the same game over scene. The only items I seemed able to click on were the door (which had a rusty padlock) and the rat-hole (which had nothing in it.) I didn't seem to be able to do anything there, so I again reloaded to yesterday's save. I tried to find the bird at the edge of the desert, but he seemed to be gone. I'm suspecting there's something I have to do with it, and it's one of those cat-rat only happens once deals, so next time I might try to reload an even earlier save and try things. So, now I'm stuck. I have a few things I can try so hopefully I can figure it out. One thing concerns me, the crying man that appeared on the bluebird screen the first time I was there and then left – maybe I needed to do something with him. I'll be very sad if that's the case, so I'll save that for after I try everything else. If I don't kill the witch when I first meet her, she appears everywhere I do. Perhaps I should do something with her elsewhere instead. I tried killing her on the eye creature screen hoping that they'd see that I'm a witch killer and shower me with riches or an exit or something else useful. It didn't help. I can also talk to the witch, which I didn't try before, and Graham argues with her like a 6-year-old. Oh, I didn't know this was a PRIVATE forest. Do you OWN IT? I can squeeze the honeycomb out onto the ground on the screen with eyes – I found this out by accident by attempting to give everything to a frog – it only let me do it on this screen so I I'm lucky I worked this out at all. Leaving the honeycomb and doing a lap of the forest before coming back doesn't appear to do anything. I'm guessing I need bait to put on the honeycomb, but nothing I have seems to work. 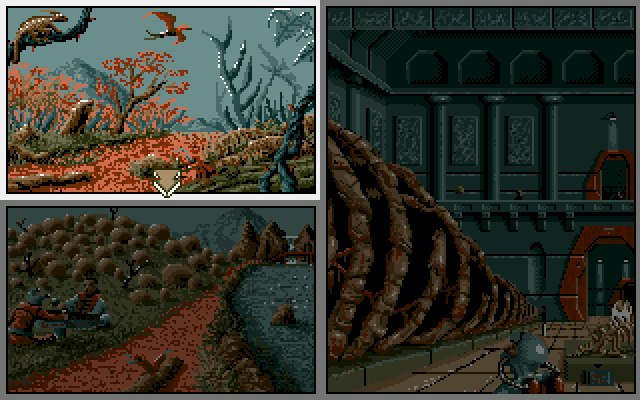 There are small steps in the witch's house – they didn't look anything like steps in the graphics to me. I'm guessing the eye creatures are small and can get up those steps but I need to capture one with the honeycomb and some bait then I can force it to use the stairs to help me escape the forest. After using the honeycomb I have sticky bees wax in my pocket instead – don't know what I can use this for. I can walk into the moat of hellfire surrounding the witch's house. Walking past the ant castle makes me do a little dance, but I don't think that has a useful purpose other than giving me some more bad owl voice acting. There was nothing to do around Crispin's house that I could find. I missed a possible death early on – ENJOY! Talking to the willow tree before talking to the prince doesn't let me say “Hey, I think your fiancee turned into a tree. If the game's going to make me lose unless I don't talk to him at all until after I've re-humanized the princess, I'll hate it forever. There's nothing new to do in the bandit tents after looting the desert temple. I seem to be good at finding new ways to die. Here's another one. 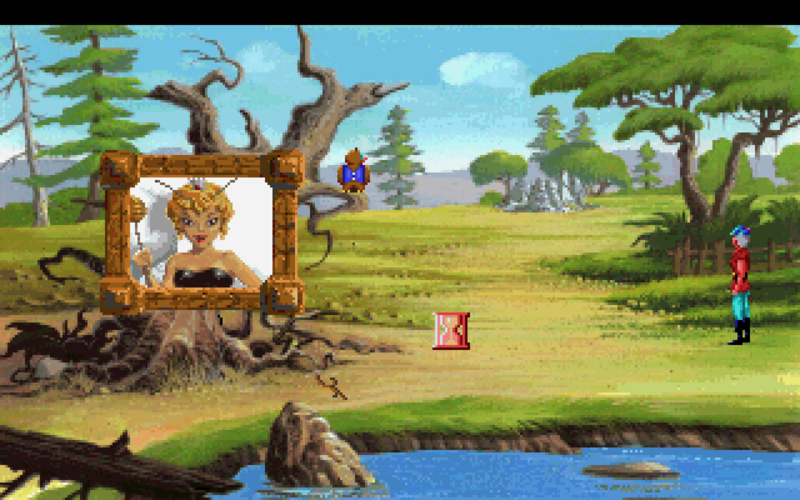 The willow tree sings a song if I talk to Cedric on her screen. As he was dying, Graham's last words were "I hope you all get killed by a bear..."
I can also use the golden needle to buy the toymaker's sled. So, golden needle or golden coin, both of which I can also use elsewhere. I noticed that the toymaker's son, who comes into the room making seemingly-random comments, first mentions something about being out of wood and perhaps having to go to the sawmill. Is there a sawmill I missed? Or can I find wood for them somehow? I fear there's an eighth useful screen in the desert – perhaps I didn't notice a clickable pixel on one of 210 similar screens while my eyes were glazing over during my 2 hour mapping session. The hollow log in the “Enter at own risk” sign screen has a comment when I 'look' at it, but I don't seem to be able to do anything else with it. I'm pretty sure I also looked at it the first time I went to the screen. I had a great idea that I was sure would work - throw a coin in the well that I found in the desert. Neither the gold nor the silver coin worked. I also tried keeping the needle and the jeweled staff to open the cellar door (I was quite proud of myself when I came up with the idea of the staff) but neither of those worked. I did some points-tests with the needle and gold coin, as they seem to have equivalent purchasing power - The gold piece gives me 5 points when given to the gypsy but no points with the tailor or toymaker. The golden needle gives me 4 points from the tailor, 2 points from the gypsy and no points from the toymaker. The baker gives 2 points for any of the silver coin, gold coin or gold needle - nobody wants to give me change if I pay too much - greedy peasants. This suggests that the tailor gets the needle, the gypsy gets the gold coin, and the toymaker gets something that I haven't found yet. So, after 4 hours of no progress, I'm out of ideas. I'm officially putting in a request for assistance. Remember the rules for requests found here. I'm stuck in either the forest or cellar, depending on which I choose to do first. I assume solving one of them will give me the item I need to solve the other. Remember to code your hints/spoilers in ROT13, and start with a vague hint then get gradually more detailed. I think at least 3 hints before the flat-out solution spoiler works well. Note Regarding Spoilers and Companion Assist Points: There's a set of rules regarding spoilers and companion assist points. Please read it here before making any comments that could be considered a spoiler in any way. The short of it is that no points will be given for hints or spoilers given in advance of me requiring one. Please...try not to spoil any part of the game for me...unless I really obviously need the help...or I specifically request assistance. In this instance, I have made a request for assistance. Thanks! King Graham of Daventry Journal Entry #2: "I've just seen enough sand to last many lifetimes and I have no desire to see even another grain of the accursed stuff – my first royal edict after I rescue my family will be to destroy all hourglasses in Castle Daventry. I scoured the desert for many miles, finding only a boot, a gold coin and a likely cursed bottle. But there is a silver lining - the gold coin has purchased information – information on my family's whereabouts. Just as importantly, I now have an item that I am certain will help me on my quest. I would love to use it immediately, but I am so very tired – it's likely the dehydration. So... very... tired...."
I don't think I can quite convey in words how boring this session was. It started well, it ended well, but the bulk of the 2 hours 20 minutes I spent was tedious busywork. 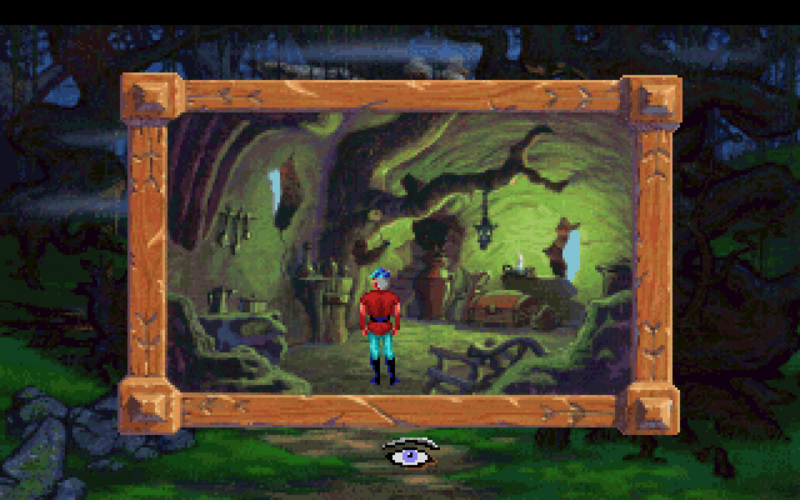 Before I continued, I loaded a previous saved game from before I bought the pie and tried using the silver coin on other shopkeepers – as this is an adventure game, the shopkeepers have limited inventory that you can actually buy - the tailor said that a silver coin wasn't enough for his blue cloak, and the toymaker requested a gold piece for his sled. 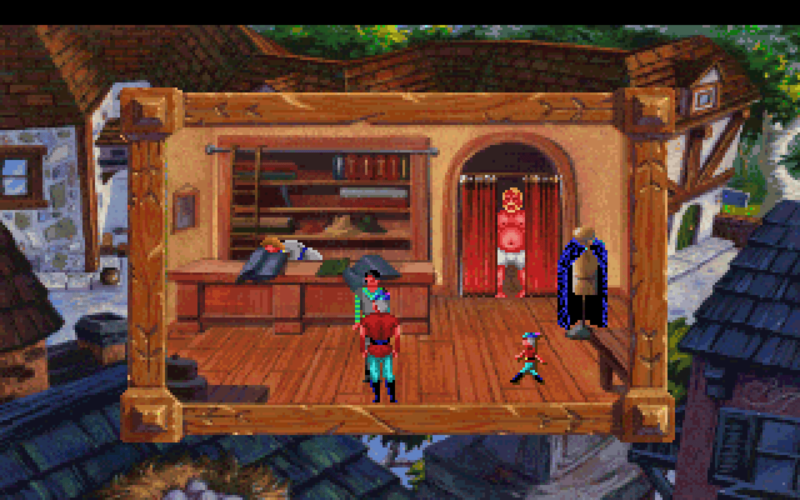 I did try the cloak in the inn, in case it was an invisibility cloak. It wasn't. I died. I reloaded. I once again tried the haystack, thinking that something might be there after I did something elsewhere, and there was, or more to the point, I could get to it where I couldn't before. They also do a great cover of "Smells Like Teen Spirit"
I never would have thought the ants would help me find a needle in a haystack. But hey, they found a golden needle, which, unsurprisingly, belonged to the tailor, who was easily convinced that his beautiful blue cloak would be a suitable finder's fee. It seems Graham is just as much Vito Corleone as he is king, trading favours for items instead of using cash or barter like a normal person. It was the tailor's needle in the first place – if I found somebody's lost stuff the most I'd accept in return would be a beer or a cup of coffee – and it wasn't like the tailor offered the cloak – Graham 'suggested' it. I know I wouldn't say no to a guy who's singlehandedly defeated a giant and a dragon. When I tried to wear the cloak I was told the weather wasn't cold enough. My deductive skills determined that I will at some point in the game go to a cold area. But now, time to go to a hot area. Bloody hell, the desert! Everything I've just mentioned took 12 minutes. My next plan was to tackle the desert – seems simple enough. And it was – very simple, but very boring and time consuming. So how does the desert work? You can only go a certain number of screens before dying of dehydration. Birds- lucky I can talk to animals - please Mr and Mrs Vulture, would you kindly bring me wate...wait...noaaaaaaaaahhhhhh. There are a few locations that contain water. So it's a simple case of travelling a certain number of screens, mapping continuously. I did this for 40 minutes, finding nothing of interest apart from two oases, which I could drink from, and some tents, which were empty apart from a fast bandit and had a water jug outside for drinking. Now that I write it, 40 minutes doesn't sound like too long, but 40 minutes of repetitive busywork seems longer than it is. At this point I'd searched 91 screens of desert, most of which you have to traverse multiple times to make sure you explore every screen on the off chance there's something useful there. At this point, I made myself a cup of coffee – not because I was thirsty, but just to get away from the damn desert – if I weren't playing for this blog I'd have definitely downloaded a map from the internet before this point. Coffee at the ready, I continued to map the desert. I found another oasis and a well - each time I found a new water source I despaired because it meant another bunch of screens I'd have to traverse. I also found a skeleton with a boot, which I took. Eventually I found a temple, where the first interesting thing happened - I died. I knew what I was supposed to do, but just hadn't done it fast enough. This time I hid behind the rocks and the bandits rode past me to the temple door, saying “Open Sesame” and hitting the door thrice with a jeweled staff. After they left I tried the same, banging with my fist as I had no staff, but to no avail. I'd clearly need a staff. Despite the game's attempt at dulling my brain for the last few hours, the answer hit me quite quickly – the empty tents from before. I returned to the tents (stopping twice for a drink, of course) and found them partying. The small tent had the staff in it as well as a sleeping bandit – I carefully snuck in and quietly grabbed the staff. Then I woke the bandit to thank him at which point he knifed me in the throat. Finally I went back to civilization leaving behind the awful desert. Here's the full map of the desert – all 210 screens, including the 7, that's right 7, screens with anything other than sand in them – a whopping 3% of the screens are useful! The minimum amount of times you have to die if you guess correctly every time is 32. I likely died at least 50 times. 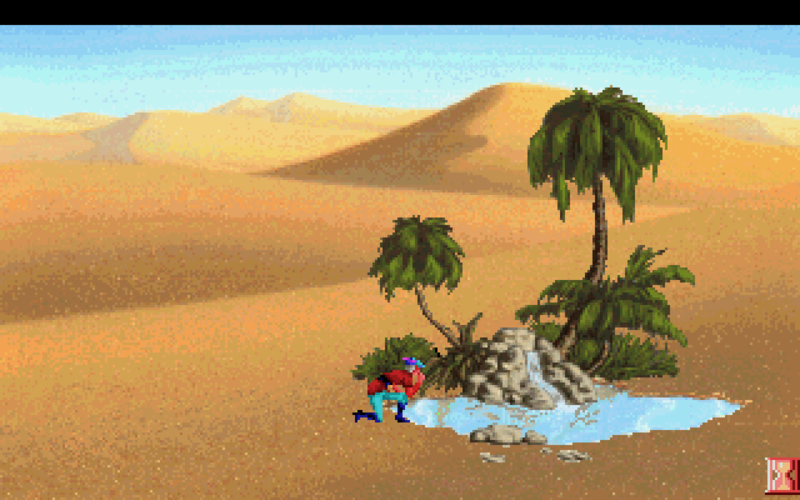 This whole desert sequence was just plain bad game design. The only way to be sure you've found every useful screen is to die 32 times, travel on 210 screens which all look the same, many of them multiple times, and there's absolutely no skill involved. It's all busywork. The fact that I'd clearly worked out the method a third of the way through and needed a break should be an indication that it went on way too long. Of course if there's a map in the game somewhere I've just wasted 2 hours and whinged unfairly on the game for this whole post. 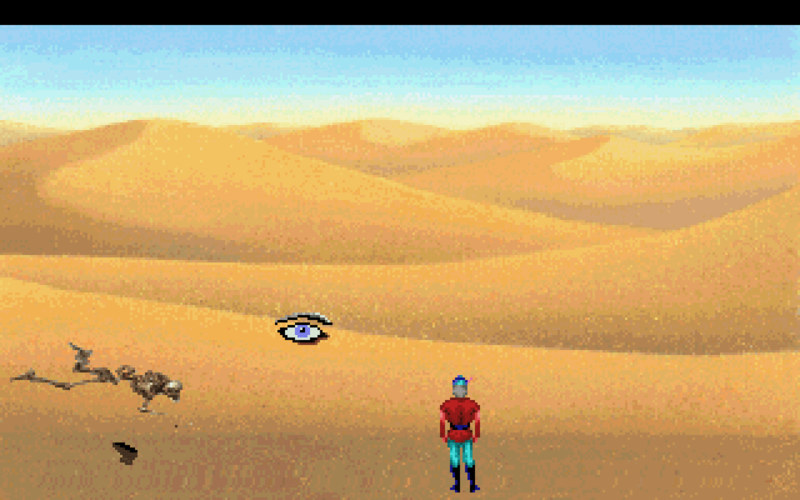 Anyway, enough complaining about the desert, on with the rest of the game, which is quite fun. 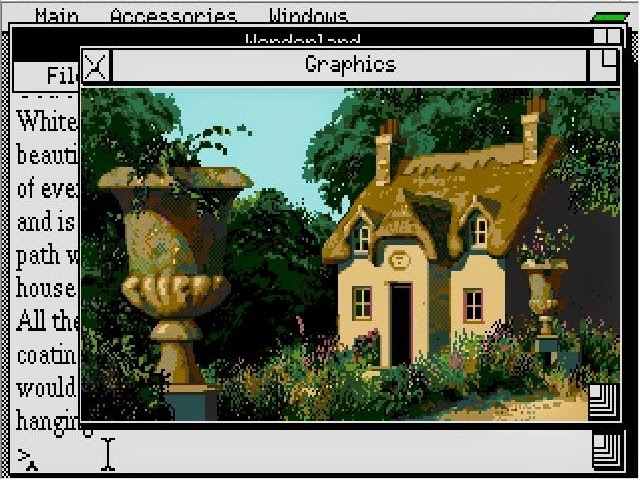 As detailed in the previous post and started by Joe Pranevich, anyone who mentions that they'll donate to an owl-related charity during the King's Quest V playthrough will get an as-yet-undetermined amount of CAPs. 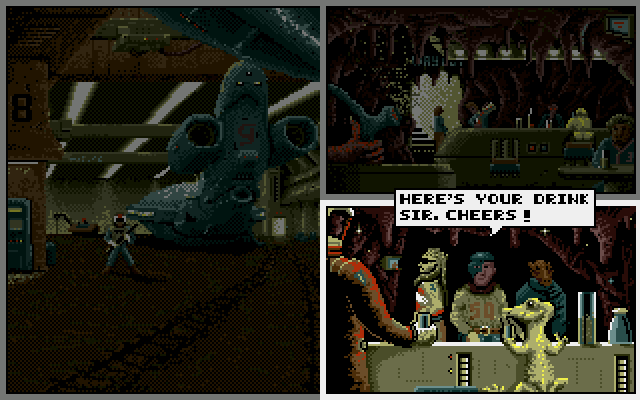 Also, any adventure game companies looking for a new artist, I am currently available! “Is it strange, sir, that my head unaccountably aches here, and I feel that I have been here for longer than I've seen?” Alice enquired, scratching irritably at her ribbon. The Reviewer chuckled, showing perhaps more teeth than necessary. Alice frowned. “That... Didn't answer my question.” The Reviewer's grin widened. As you might have guessed from the last post, I already know this game somewhat, and can tell you right now that, while the descriptions are sometimes interesting, the pixel art is mostly lovely for the time, and the game has technical experimentation I'm quite fond of, one thing I'm not fond of is the often arbitrary nature of item placement, some of the puzzles, and some of the deaths. Important note: You do have to stand up first. Here's a good example, we fell on a pile of leaves and twigs. We can look at them, and we can search. We need to search, because there is a key inside, and examining the heap gives you not a single clue that there's a key in there. Locker on one side, 10 on the other? Right, let's keep an eye out for a Locker 10, then! We find ourselves, as you can see, in a little corridor. We're locked in for the moment, with not a key in sight. But first, let's go to the far end of the east corridor, where an important mechanic awaits. Specifically, a bottle (in plain sight) and a cake (hidden under the table in a glass box). Anyone who's remembered Alice in Wonderland will know what these do, but for those who don't... Let's take a look at our score text again. “You are normal sized.” Size is an important part of some of the game's puzzles, and it won't always be clear when we have to go smaller or bigger, or even how much smaller of bigger we need to get... Because yes, there are multiple sizes. Let's experiment a little. Looking at the bottle, there is “some potion” inside. 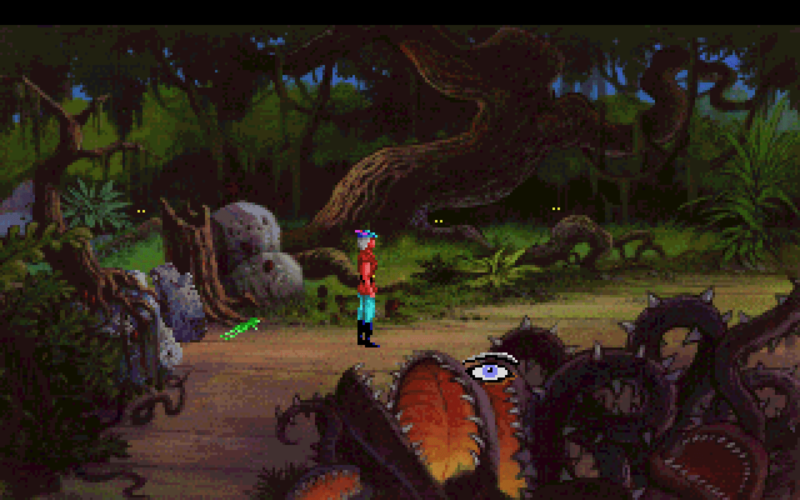 Well, what's the harm in drinki- Ahahaha, as expected, we're tiny, we're small, we're... big one turn later. And there's no potion left. Hrm. Well, there's still the cake, I supp-OUCH. That, in one paragraph, is a further Dead Man Walking (wasting five minutes of our time) and another trip to the medicine cabinet, another damn reload. Well, if we knew the source, we'd know that was a silly idea in the first place. Not that it matters, but we ate all the cake too. There's also about five or six doors in this one room. So let's try the other end, passing a door with a C on it (near where we fell), a wooden door, and some furniture that seems to just be there as furniture. How odd, a Piano is playing itself here, and some chairs are playing... Musical Chairs, oh ho ho ho! This is a nice easy puzzle, although if you're not careful, you can definitely die in here. One key's on a musical sheet (Key in C), and the other (Key in G) is inside the piano... Exactly where you'd expect musical keys to be (20 CAPs to the first person who correctly notes why these keys are unusual)! And... A thing I had not expected, or misremembered. Actual music. It's about a minute long, it's cheery, aaand... You'll probably have finished listening to the music before you've managed to switch discs the two or three times it asks you to and loads the graphics. 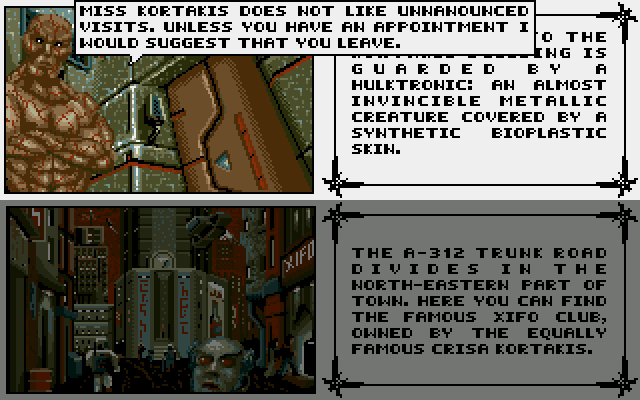 I now remember why I preferred the DOS version more, less music or not. Remember, sit on a chair when the music stop- Oh, it isn't stopping, and nor are the chairs. ...I can't believe I forgot that. Either way, getting the second key requires a bit of fiddling, taking the music sheet when the chairs are in the right position, getting on a chair, shrinking, getting into the piano, getting the key, and getting the hell out before you break the piano (And, incidentally, your head). After that, it's time to open some doors! 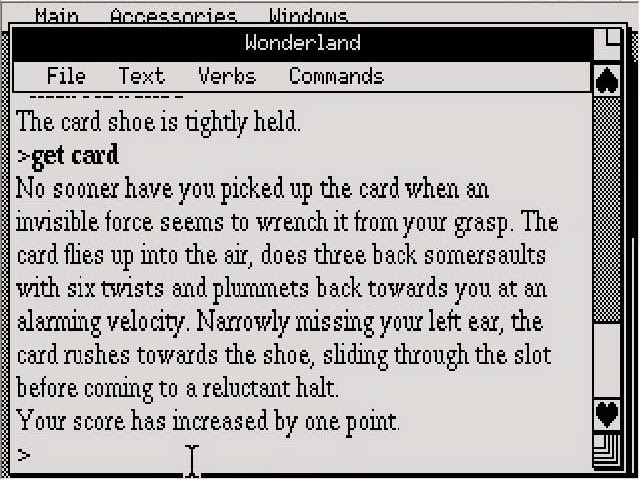 The Broom Cupboard, opened with the Key in C, has three items, one of which (the card-shoe) is utterly necessary to the endgame. Thankfully, you can't leave the area without the overalls that are also here. For extra oddness, the three middle rooms are disk 2, the outside ones 3. Either way, once we've gotten the Key in G, we can unlock the tiny golden door (of no use to us right now because we're too big), get visited by the rabbit, who drops a blue fan and blue gloves, and then... What? This is where the puzzle isn't so elegantly designed. See, we have overalls, which are Gingham patterned (red and white checked cotton), but they're slightly too small for us. The cake is obviously not the answer. The gloves don't appear to be that important. We basically have to look through, and, in a process of elimination, work out we're meant to open the fan, wave it, and get into the overalls... Then wait for Mr. W. Rabbit to come back, mistake us for his maid Mary Anne, give us a key to his house and some demands, then leave the white door unlocked. Stepping through, we find ourselves... With no visible way back, and a second set of demands, this time from the Knave of Hearts, who tells us what we already knew (It's a dream), and that he'll tell us how to escape if we steal treacle tarts from the Queen of Hearts. North, to the Palace Grounds. Nuh-uh, No Way Jose, not yet. That's Heart Country! Every southerly path takes us to some woods, and straight south is a grin floating in midair and a saucer on the ground. I don't know about you, but I don't trust floating grins. East is the path to the residence of Mr. W. Rabbit Esq, along with a poster telling us about a croquet game... We're not to be late if we're invited... Or heads will roll. Argh! Rabbit's house is very badly maintained, which leads us to believe that Mary Anne, the maid we've been mistaken for, has been gone a very long time. The grass is overgrown, there's no laundry on the washing line, and the house itself doesn't look too great either. So naturally, we steal the washing line and the sole clothes peg, forlornly hanging on it. Time to rob Mr. W. Rabbit. Step one: Unlock the front door, and in we go! What the... Did anyone get the number of that card? We also steal an egg and a cup from the kitchen. So, with all that bumf out of the way, we are finally in the White Rabbit's room, which has the pink fan, and the pink gloves we were sent here to get. You may be surprised to note that we're already a quarter of the way through the game... And already, we've found things where the developer has relied more on the hint function than designing the puzzles well. you can interact with most of them... And most of them are not very helpful. 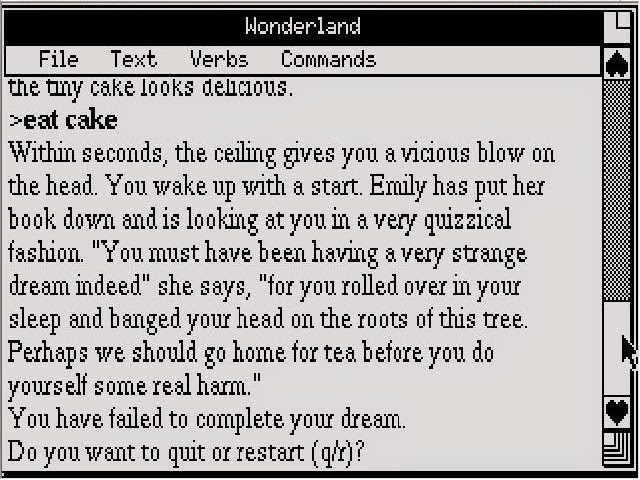 There is no obvious clue as to the uses of the fans, although the potion and cake are obvious to anyone who's read the Wonderland stories (and there are clues on their containers), there is no clue that the No. 10 Locker key is there (and, as far as I am aware, we can completely miss this item, leading to a Dead Man Walking scenario). We have several items, and I will say that successful completion of this game requires all of them. But we have a goal: Get the hell out of Wonderland, escape this dream that, really, doesn't turn out to be a dream. More of a nightmare. King Graham of Daventry Journal Entry #1: "I thought my days of adventuring were over, but apparently not. On coming home from a walk, I found a hole in the ground where my castle used to be. My family and trusted friends were in that castle. Fortunately, my new friend, Cedric, saw the whole thing as was able to direct me to his master, a wizard named Crispin. Crispin gave me something to help me talk to the forest creatures, which ended up being terribly useful. I'm still no closer to finding my family, but I've made some allies who will no doubt help me along the way. 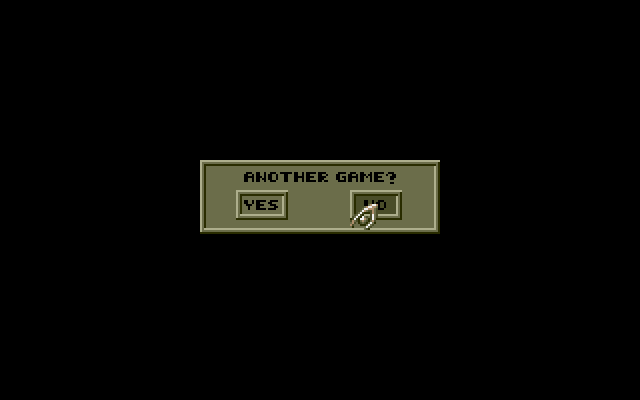 Now, time to continue my quest..."
The game starts with an overly long and drawn-out introduction, something that would be annoying in a current game, but back in the early 90s, I used to gobble that stuff up. The fact that the graphics and use of voice were great for their time means I can forgive them for their indulgent lengthy closeups done purely to show off their mastery of the technology. This 11 minute introduction could easily have been cut in half without harming the narrative – but it's all about wowing the gamer with great graphics and sound! And people say gaming has changed! After finally getting control of Graham I began to explore my surroundings. 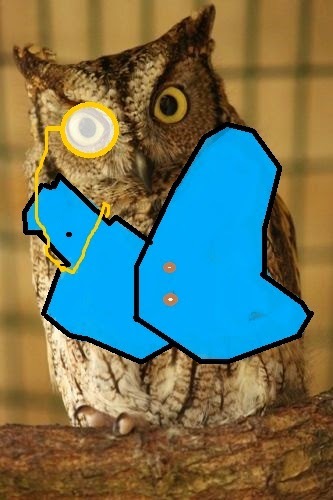 Cedric suggested I go south to the town, so I went west to prove I was no owl's puppet! I soon met a man who lost his fiancee and a bluebird drinking from a tree, and could do nothing with them. Then I saw a snake, specifically, a poisonous snake! The snake doesn't do anything no matter what I try to do with her, apart from tell me the road is hers, so I clearly need some kind of snake repellent before going east. I mapped out the area and found to my pleasure that it was consistent, meaning that if I went west and then south I would get to the same place as going south and then west (not necessarily so in many adventure games.) 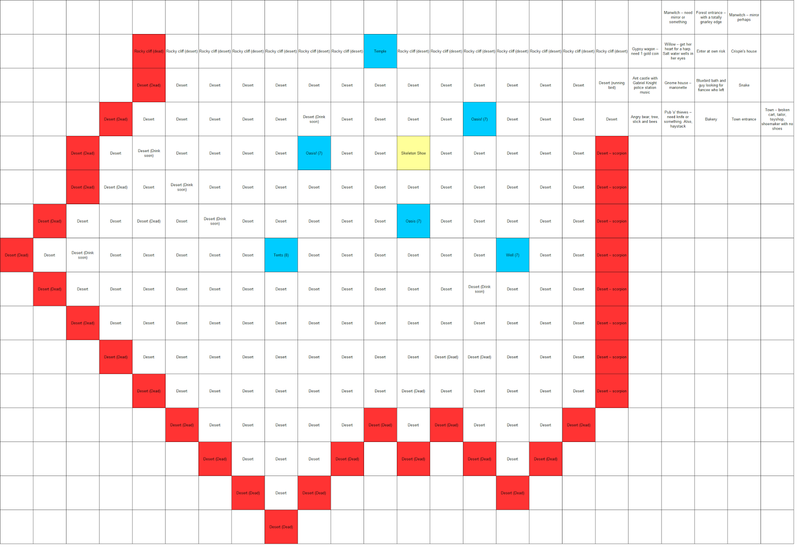 So, simple grid map it is. 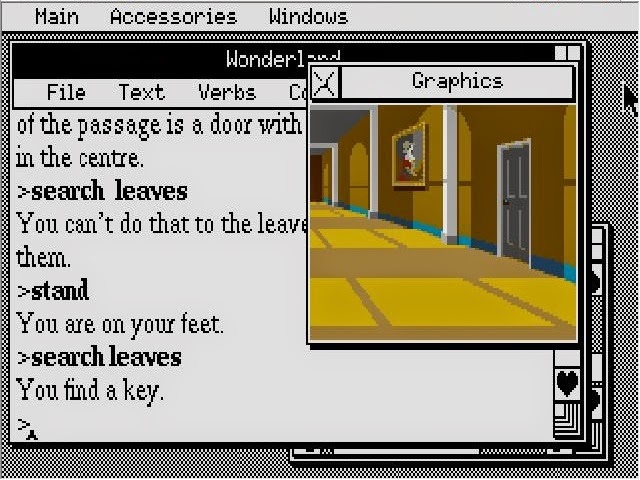 I also noticed that, unlike earlier Sierra games, I could simply click on where I wanted to be and Graham would find a suitable path himself. 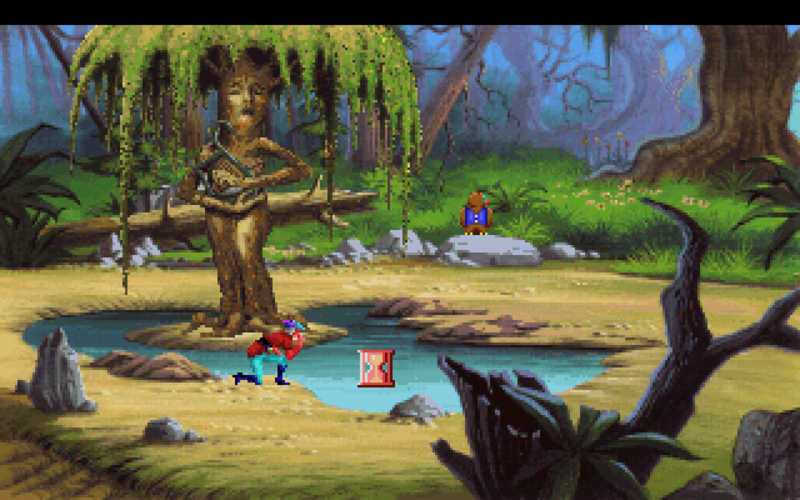 Saving me from having to manually dodge every rock, bush and clump of grass - thanks, Sierra. Cedric refused to enter the town because he was scared by a dog once, so I went on alone. In town I met a man fixing a cart (who left after I visited a shop), a tailor, a German toymaker with a child who wants to keep one of the toys for sale, a shoemaker who doesn't have any shoes for sale and four or so townspeople who have a generic line to say if you try to talk to them as they walk around. They're useless, but good for the atmosphere, making the town seem more alive. After I left one of the shops, the man was no longer fixing the still-broken cart, but there was a silver coin there, which, being the benevolent and kind king I am, I obviously pocketed for my own uses. Somewhere out there is a man whose cart no longer works so he can't make a living selling goods, and some rich king from another land takes his last silver piece for himself. I figure I'll probably be saving these townsfolk from an evil wizard at some point, so it's only right that I collect taxes from two realms now. I next visited the bakery, and found that they were selling custard pies for a silver piece. Having just decided through some particularly baffling logic that I was clearly the rightful owner of the silver piece I found, I bought a pie from the baker who made a point to tell me how delicious it was. Was that a hint? I checked out my points (I had six) ate the pie (which according to the narrator, was definitely delicious) then checked my points again (still six). Ha! Nice try game, but I'm not falling for this trick. If your pie doesn't give me the ability to fly or absorb dragon breath or something I don't care how delicious it is – I'll just keep it until I can trade it in for an old pair of trousers at some point instead. Restore a saved game time! Coincidentally, William Baker and his brother both took up a career in baking. 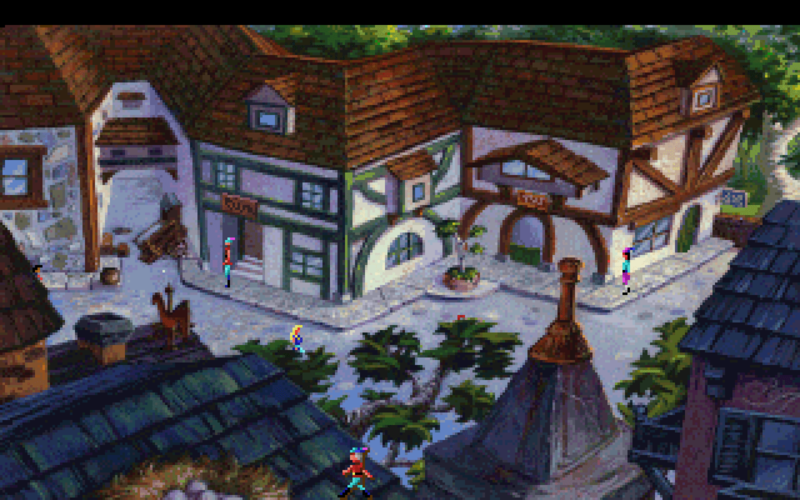 To the west was an inn, which Cedric refused to enter because he doesn't like the place. I could do with a stiff drink so I entered. Three men were speaking in hushed tones and the narrator suggested I could hear them if I got a bit closer. I followed the narrator's advice, and promptly died. Remind me that if I ever meet that narrator in person I should raise his taxes. Outside the inn was a haystack, which I searched to no avail. I was expecting Graham to get pricked by a needle while searching, or to find something else there, but nothing happened. Further to the west was another screen that seemed determined to kill me. A bear was trying to get honey from a beehive. There was a stick on the ground, which was clearly a valuable item because when I clicked the eye icon on it I was told what it was! Okay, death number two. Maybe I'll come back later. To the north was an anthill and a gypsy camp, neither of which I could do anything with right now. 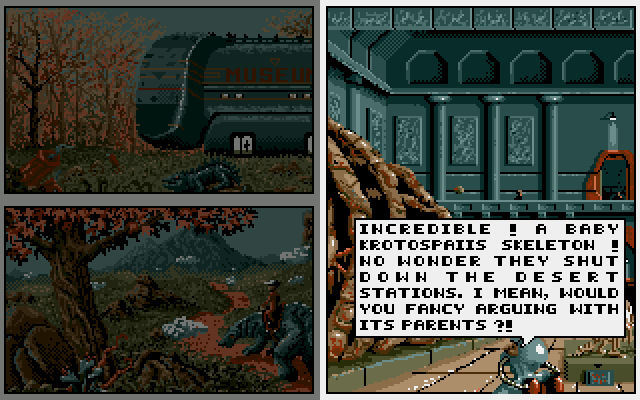 I did, however notice that the anthill music bears a remarkable similarity to Gabriel Knight's Detective Mosely theme. A desert lay further to the west, and from my memory of playing the game before, I know I have to map the desert because I can only last a set number of screens (five?) before dying of dehydration and there are a few random oases scattered about. I went to the first row of desert screens, and found the ire of a small but dangerous scorpion. Death number three. Need scorpion-proof shoes I suppose. Oh, the tears of unfathomable sadness! Mmm - Yummy! Yummy, you guys! To the west of Crispin's house was an 'Enter at own risk' sign at a forest entrance. Being out of ideas, I entered. The cowardly owl refused to join me. On the second screen of the forest (no matter which way I went) I was killed by a witch, who looked more like a wizard to me – the beard gave him away. The manwitch threw some kind of energy ball at me which turned me into a toad – I suspect I'll be needing a mirror to reflect his spell back on him, but haven't found one yet. There was also a small house with two gnomes - the young one was playing with a marionette - I feel like I'll need to either give the marionette to the toymaker's granddaughter or give her doll to the gnome's grandson or both or somehow convince at least one of them to part with their beloved toy. At this point I was sort of stuck. I walked around trying my magic wand on everything (Crispin gave me a wand at the beginning and told me it would need to be treated well before it would work, or something equally ridiculous) and trying to give a custard pie to everyone, as well as offering a fish to everyone and everything. I had earlier found a rotting fish in a barrel in town but got annoyed when the baker's cat refused to have anything to do with it. Then the obvious hit me – bears like salmon – I threw the fish near the bear and he took it and wandered off. Queen Beatrice of the bees thanked me and offered me a free taste of her delectible honeycomb (that one's for you, Kenny.) I tried to take another piece, but the narrator told me that would be unwise – not as unwise as getting close to three thugs in a bar mind, but still unwise enough that Graham refused to do it. Going north to the anthill guarded by the New Orleans police department band, I found a dog trying to play with the dirt castle. Having just picked up a stick, the answer seemed obvious. The dog took my thrown stick and left, towards the desert unfortunately – if I see dog bones next to a smiling scorpion later, I'll be unhappy. King Antony of the ants thanked me and told me that his subjects would help me out at some unspecified later time. I decided that ants might be very useful for eating through rope so I deliberately got myself captured by the inn thugs again, in the hope that my new ant friends would come to my aid. They didn't, the unreliable little bastards, so I reloaded and decided to call it a day for my first session. So tune in next time, when I'll likely have to save a swarm of flies from a hungry antelope! Joe Pranevich mentioned in the intro post that he'd generously donate up to $25 to an owl sanctuary to make up for his feelings of hate towards poor Cedric. 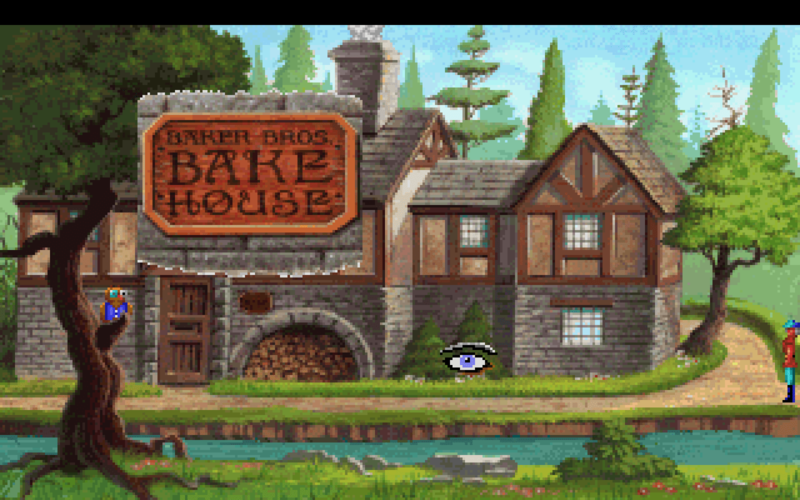 From playing King's Quest V I already know owls are afraid of towns, dogs, forests, witches, deserts, bandits, inns and bakers. The owls need our help! So, anyone who joins Joe in his quest for safer non-witch-infested sanctuaries for owls, will get themselves some bonus CAPs as well as the warm fuzzy feeling of helping a creature who is, well, warm and fuzzy. I'll be the first to join Joe in his quest with my own $5 donation. Ageless, Faceless, Gender-Neutral, Culturally Ambiguous Adventure Person's Journal #1: It's hard to be positive about being a B.A.T. operative. The pay is lousy and mostly goes towards food and drink – hell, they didn't even land me here on Selenia with any ammo – they barely give you any idea of what you're ready to face.. and they're so devoted to secrecy that I had to have my debriefing meeting with a strange guy in a toilet. Oh, and it's not until NOW that they tell me the planet I'm on is going to blow up in ten days! Naturally, they didn't give me enough to fly back out of this rock.. guess it's time to start pumping people for clues. Watch out Terrapolis, here I come! who specialises in conversations (not to mention electronics and stealing). Looks like your average adventure gamer to me! B.A.T. is not a game that I think I will ever – or could ever – love. It's already managed to annoy me with its interface rather heavily (in a rather short play session, might I add) by being extremely inconsistent. If you click on the screen when it has the standard cursor (which according to the manual is 'the falcon's eye, the symbol of B.A.T.') it brings up B.O.B, the arm computer system. 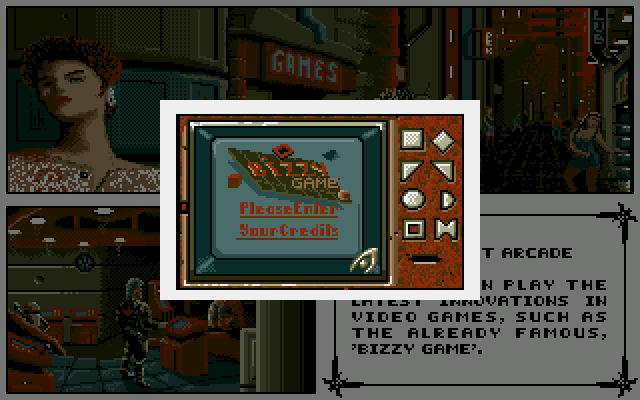 It looked to me at first that this was also the load/save option, though that was actually the 'pre-programming' set thing that I couldn't wrap my head around in the manual on the first glance. Anyhow, in and of itself this is straight forward. Unfortunately, it doesn't work quite that way. It can appear/not appear at seemingly random, with the 'conversation' icon sometimes coming even in the sky or the ground. Utterly maddening. Not being able to reliably bring up what is essentially the main interface is simply ridiculous. 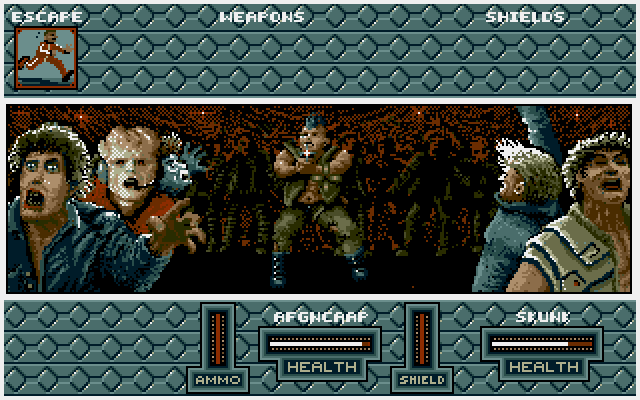 The combat interface is utterly ridiculous, being even less tactical than the previous game Elvira was. Unless I'm missing something, it consists of selecting a weapon and clicking like a madman until the other person dies (or you do.) Uuuugggghhh. All because the geniuses in B.A.T. didn't even give me ammo to go with my guns on introducing me to the city. Not so much as a robotic sausage. Life.. don't talk to me about life.. I find myself wondering if these screens will give me any sort of warning that I'm about to starve to death without having to constantly click on them, as I'm utterly sure I won't remember to look.. Anyhow, I do suppose what little I've played through should be explained. On landing in the spaceport and messing around with the interface for about ten minutes before even finding the area I was due to enter, I went to the unirace restrooms (although, as the game says, they are equipped for all types of anatomies, they're not very pleasant), I spoke to a police officer who gave me a few clues. Apparently, Vrangor (evil genius extraordinaire) has 'access to some very strange places', to find Merigo, I should 'try the seedier parts of town', and when I asked him of the city, 'the only access to the engines is in the old building'. I can only imagine this is him suggesting that the engines are a weak point to be targeted by bombs? I'm not even completely certain what the engines are for, given Terrapolis is supposedly a city built on a plateau in the largely arid Selenia. Anyhow, in going to the slightly ajar restroom stall, our local contact (complete with his B.A.T. pin badge on the right hand side of his coat) gives a quick monologue/summary of what the manual and back cover have already told us. Vrangor is crazy. Selenia is strategically important to the Earth, as it has large quantities of raw materials, and Vrangor is threatening to blow the city of Terrapolis if all of Earth's interests don't leave it within ten days. 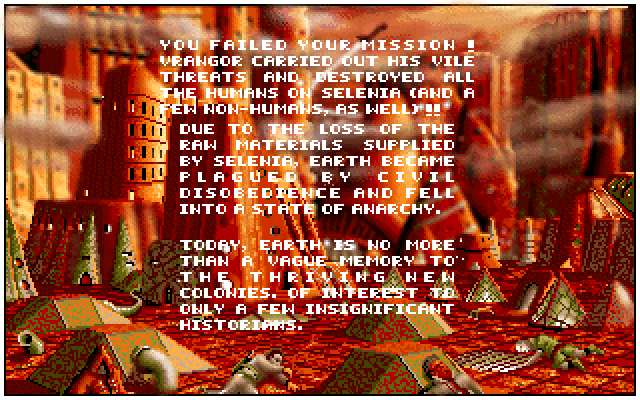 While Vrangor has hidden his tracks well, Merigo has been located entering the planet via an 'ecg wave' (his brainwaves, I'm guessing) and as such, we're loaded up with some guns, five hundred Krells (the local currency), a credit chit with 1000 Krells on it, and a hologram of Merigo to show to whoever might have seen him. Neat! Sweet, equipment! Now why couldn't we have met somewhere OTHER than a toilet stall? Working here really is the.. well, you know. Here's probably a good point to mention that the inventory system is legitimately horrible. Each item is listed singularly, and the only selection is made with a 'NEXT' button, meaning that if my inventory should bloat, it'll be quite difficult to work out what I've got exactly. So, I've been given two weapons (a 'hacker', a weapon that 'shoots several thousands of missiles simultaneously', and a 'Haas 10' which is a pistol-like missile launcher with heat-seekers and dumb-launchers) – but no ammo for either. Luckily, I don't plan to spend much of this game shooting if I can help it, as the combat is really that bad. (And yes, this is a homemade video by yours truly, but this is first chance to plug the 'Adventure Gamer' YouTube channel, which will no doubt see occasional uses from the writers around. Also note the way I find someone to 'talk' to (and shoot at) – it's literally random as to whether or not you manage a hit. 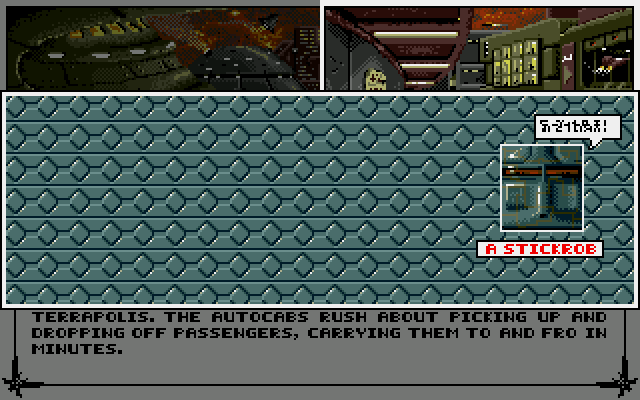 I also left the full DosBOX screen up to make it clear – combat is that fast even at 3000 cycles.) From the spaceport, we end up in a random sort of 'travel lounge' place, I imagine it's supposed to be – there's a vending machine to buy some food along with a club, so this is essentially the Duty Free area of the spaceport. Apparently, the club (or 'pub' as the game calls it in spite of it having the word 'CLUB' written in the staircase leading to it) has a reputation for being one of the shadiest places in town. A number of visitors have been found dead, too! Oh no! What's with that little E.T. looking thing? I still don't fully understand this. The little screen you find in the corner requires a bribe for 'information on the city' for no apparent reason, though you can just leave, with a picture of what looks like a gun poking towards you.. but it has no payoff aside from this thinly veiled threat. 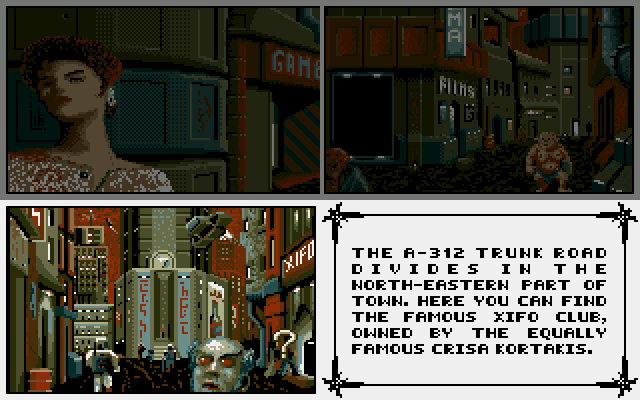 Given that the Space Pub/Club/Bar/Place To Imbibe Overpriced Drinks was largely a bust (unless I was missing something important in there and just couldn't work it out from the interface), the next screen is 'Astroport Square', a place that is 'teeming with people'. It's pretty much what you'd expect coming out of an airp-- er, spaceport – overpriced hotels, overpriced fast food. Again, the place seems largely to be useless, though it does serve its function of leaving a place to keep your B.A.T. agent healthy. I'm imagining that one of the meters on the B.O.B. unit (getting so sick of these acronyms) is indicative of how much rest you've managed to give to them, with 'drink' and 'calories' being the other key health indicators. Still, I'm not going to worry about it until it's needed – so after buying a Dish of the Day special at the Mecafood Center™, it's on to more interesting places..
Just for the record, here. 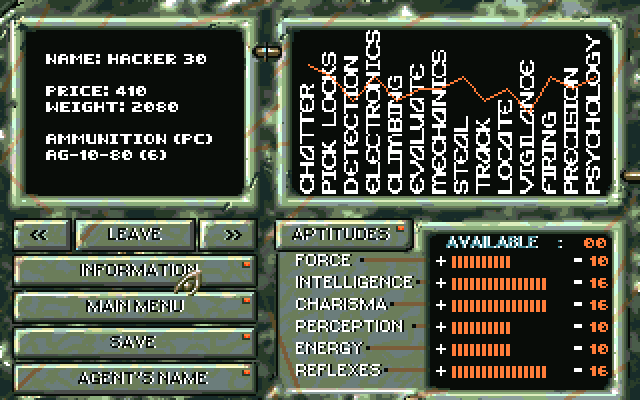 I selected the Hacker, which has AG-1080 charges. I had to double check, as this read awfully like 'A610-80' to me in that font.. So, after having ammunition to go along with my willingness to pump people for information and steal from them recklessly (as is the true adventure gamers' way), I went on a spree of information gathering. A 'skunk' (essentially, a human street punk) told me that someone near the park mentioned Vrangor, and one 'Crisa Kortakis' has a lot of influence here on Terrapolis. (A Glockmup, a 'traveler native to MIGA, not very intelligent but very proud, often destined to carry out dirty jobs and often used as assassins or robbers as they're 9 foot tall', mentioned that influence and money were going to be my best way to make my way around Terrapolis, so I'm doubtless going to have to find her at some point.) 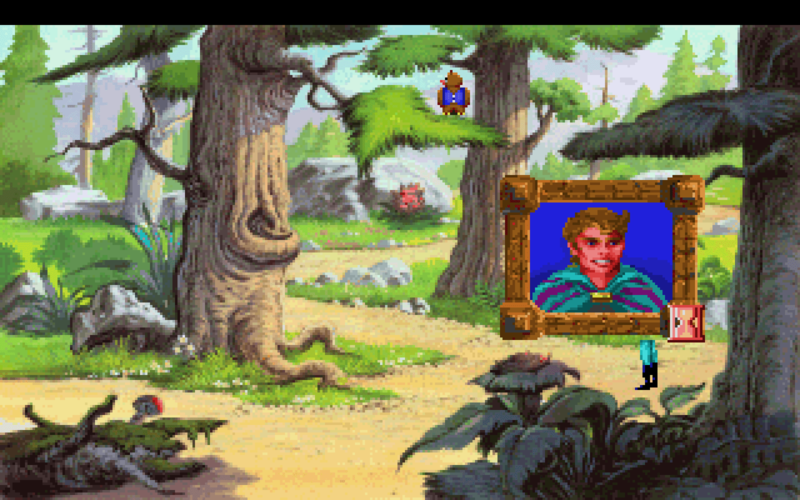 Showing the hologram to a Kradokid (one of the races populating the planet Sabellius, resembling lizards with only one eye and extremely intelligent but very fraternal) has them suggesting they might have seen them on 'Tri-Dee' – and any attempts to speak to a Stickrob (a robot that is 'slightly less intelligent than a human') is simply greeted with the note that they don't tend to care much about the goings on of humans. So, while I've technically not gotten very far, I felt I had to end before the interface completely destroyed my brain. Still, I have a clear set of directions – I've got to share my hologram of Merigo around as openly as I can manage and track him down. Even though the manual suggests that the Glo(c)kmup (in the manual it's Glokmup, in the game a Glockmup) aren't to be trusted, something tells me that the direct mention of 'Crisa Kortakis' means that I'm going to have to hunt them down, too. This game already feels like a chore, and I haven't even gone past an hour of play yet.. I really hope that this picks up! New Poll: Choose the best game of 1990! Game 51: Rise of the Dragon - Gone is my sweet! Game 51: Rise of the Dragon - Lost!